The horses were stabled in our yard in Ballaghaderreen and shod in our forge as and when the need arose. He purchased and rented land suitable for the horses to graze and from which to harvest hay and oats with which to feed the horses. In the event that the horses were idle for some days before a funeral it was the practice to give them a gallop under a sidecar or trap before putting them under a hearse so that they would not be so lively and behave as expected. Many a driver was reprimanded for leaving the yard with a beautifully turned out pair of black horses and returning with "white" horses. No, not a conjuring trick but the result of driving the horses too hard and having them lathered with perspiration. Before the horses were allowed to leave for removals or funerals, they were all curry combed until they were gleaming black. They wore beautiful black or white ostrich feather plumes (as appropriate for an old or young person), well-oiled harnesses, polished brasses and hooves painted black. The driver sat on the right hand side of the hearse seat and was accompanied by the mute on his left (not afflicted thus, but so called because it was one of his duties to remain silent at all times). The driver and mute were attired in great coats, bowler hats, silk scarves, leather gloves and riding boots and underwent the same scrutiny as the horses before being allowed to depart the yard. The funeral director, resplendent in top hat, tailcoat, waistcoat (complete with gold-watch and chain), trousers and highly polished boots would lead the cortege. The last remaining horse hearse (used for the last time during the Suez Crisis) has been restored completely and is on view by request at our Ballaghaderreen Funeral Home. It is a Marsden Town Hearse, built on the Harrow Road, London. In 1926 he purchased his first motor hearse and two mourning cars. They were Armstrong Siddleys. 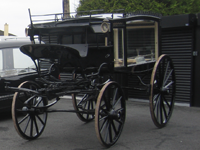 This caused much consternation among his customers as the older generation wanted the "proper" horse drawn hearse and the younger generation wanted the "modern" motor hearse. These vehicles were among the first purchased in the area and were either loved and admired or hated and despised. All the coffins and caskets were made on the premises, both native and imported timbers being used in their manufacture. The native timbers were mainly elm and oak and were sourced locally from the large estates of the area such as Clonalis House at Castlerea, The DeFreyne Estate at Frenchpark and The Mac Dermot Estate at Monasteraden. They were felled using manual crosscut saws, felling axes and only later with chainsaws. They were then drawn by horses and later by lorries to our sawmills where they were processed into the various sizes needed. The sawmills themselves were powered by Lister diesel engines before the invention of the electric motor. A successful coffin/casket wholesale business was in operation until the mid 1950’s. Five coffin makers were employed with several apprentices and finishers to meet demand. Commission agents travelled around Ireland selling the respective lines. American oak coffins and caskets were the best sellers. The coffins and caskets were deftly wrapped in hessian, transported by the excellent rail service that existed at the time in Ballaghaderreen. Tom Sharkey I, died on Good Friday 1945, a day he had always maintained as having nobody on duty at the Gates of Heaven! His son, Tom Sharkey II, (my father) joined him in the business in 1931 and wanted absolutely nothing to do with horses unless they were in abundance under a bonnet. He considered any engine less than four litres as inadequate. He rationalised the business and we became Funeral Directors and Coffin/Casket Manufacturers. He mechanised production, which was previously very labour-intensive. He was innovative and introduced many designs and concepts, some of which are still in production today. Because of his passion for fast cars we nearly evolved from proprietors of a forge to proprietors of a garage, which would undoubtedly have had some agency or other for exotic high-powered cars. He was however, to get part satisfaction for his passion from the large American cars which we had converted to hearses over the years, the Dodge’s and Chrysler’s and Chevrolet’s and Buick’s and Ford’s. For most of his private driving he favoured Mercedes but didn’t mind the occasional large American car. I recall in particular his 1959 Ford Fairlaine complete with tail fins and V8 engine of course. He studied the American way of death and incorporated many of the ideas into the business. He was a stickler for punctuality and was widely noted for this. He concentrated his energy on developing the funeral side of the business to make the firm solely funeral directors and so it has remained to the present day. He retired in March 1988 and sadly died on October 30th, 2002. I, (Tom Sharkey III) became the proprietor of Tom Sharkey & Sons in 1988 opening the first funeral home in Ballaghaderreen that August and a second at Frenchpark, Co. Roscommon in 1998. I introduced embalming for all deceased persons in 1988 and built an embalming theatre so that the service was available in-house. I served for eleven years on the Council of the Irish Association of Funeral Directors and was President for the term 1998-1999. My eldest son Tom Sharkey IV who has a passion for funeral directing and embalming, joined me in the business in 1997, something his grandfather was particularly proud of, as indeed am I. So, for four generations we have had the honour of carrying out funerals of the rich and famous, the poor and forgotten and all those people in between, with the same dignity and understanding to which all humans are entitled. Hopefully the tradition will continue for many more generations of Sharkeys. Tom Sharkey (III), March 2003. The above article formed a large part of an editorial published in The Roscommon People in October 2010 on the centenary of Sharkey Funeral Directors. The story of Sharkey Funeral Directors since the publication of the above article was edited and extended in the following paragraphs, written by Tom Sharkey IV. I (Tom Sharkey IV) officially joined the business in 1997, though having been involved in various aspects of the business as far back as my memory can recall. My father retired from the business in 2008 and still advises my business initiatives when I occasionally manage to find him not gardening with my Mother or with a fishing rod in hand. From 1997 onwards we further computerised many operations in the business and evolved our website to keep pace with the developing Internet. As a natural extension to the Funeral Directing business, we launched our full-service florist shop, All Seasons Florists in November 2009 catering for all floral occasions. We employ wonderfully artistic florists producing highly fashionable and innovative displays and it gives me great pride to see floral arrangements for all of life’s great occasions being created here. For four generations we have had the honour of carrying out funerals for the rich and famous, the poor and forgotten and all those people in between, with the same dignity and understanding to which all humans are entitled. Now with All Seasons Florists, we have the honour of serving our community in so many other life events. Hopefully these traditions will continue in the Sharkey family, for generations to come. Additional material by Tom Sharkey (IV), October 2010.